If you need to head to Secretary of State this week, expect to see longer lines thanks to a bill the governor signed earlier this year. Gov. Snyder signed a bill ending all driver responsibility fees, starting Monday, October 1. Those fees, which were tacked on to certain traffic offenses like drunk driving, can total thousands of dollars and had to be paid off before drivers could get their license back. Beginning today, all those fees have ended and are forgiven. That means hundreds of thousands of Michiganders will be able to get their license reinstated. Plus, people applying to get their license back before the end of year also won’t have to pay a reinstatement fee. Refunds will not be given for those fees already paid before October 1, 2018. The Michigan Secretary of State has hired more workers at its offices in anticipation of the end of driver responsibility fees. You can get more information about drivers responsibility fees and restoring your license online here. Remember, you can take care of some other SOS services online via their ExpressSOS.com website. You can get more information about those services here. MICHIGAN — Of all 50 states, Michigan now has the cheapest gas prices in the entire country, according to data from GasBuddy.com. But it likely won’t last long. Michigan’s average price for a gallon of gas is $1.802, barely beating out Oklahoma’s $1.804 per gallon. Nationally, the average is around $2.03 per gallon. GasBuddy.com analyst Patrick DeHaan said on Twitter it was back on Feb. 26, 2009—more than 2,400 days ago—that gas prices were this low in the state. DeHaan also said it’s likely the lowered prices won’t last more than 24-48 hours. DeHaan says it’s likely because of some ‘healthy competition’ as gas stations are continuing to try undercut each other. But he said it won’t stick around. Both Kalamazoo and Van Buren counties are averaging the cheapest gas prices with an average of $1.60 per gallon. Missouri has the third cheapest gas in the state with an average price for gallon around $1.817. ‘Tis the season for the changing of the leaves — and a new survey shows Michigan is home to the nation’s best autumn drive. 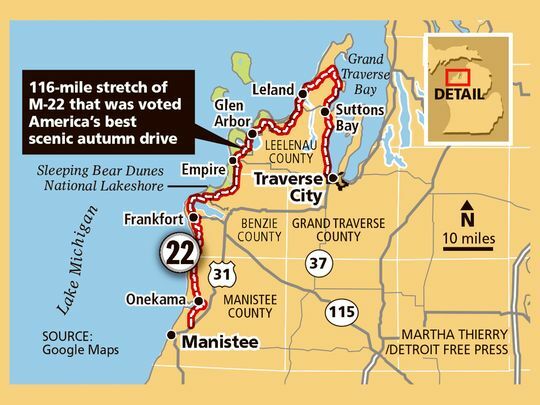 According to USA TODAY and 10Best readers, upper Michigan’s M-22 highway is the most scenic drive in the country to view fall foliage. Maine’s Historic Route 1 and Hocking Hills Scenic Byway in Ohio. But don’t rush Up North just yet. The Foliage Network reports very little change in the leaves in Michigan’s lower peninsula, delayed by a gentle Indian summer. The 2015 Chrysler Employee Motorsport Association (CEMA) will present its 26th annual Charity Car Show on Saturday, June 6, on the grounds of the Walter P. Chrysler Museum at 1 Chrysler Drive in Auburn Hills, Michigan. This year’s theme is “Celebrating the Jet Age of Automotive Design,” and will feature a 1963 Chrysler Turbine Car with periodic start-and-revs. The show benefits Leader Dogs for the Blind of Rochester, Michigan. Hours are from 9 AM to 4 PM, rain or shine. The show field usually has over 300 cars (it’s open to all makes) with a disc jockey, food, and vendors; it is also a rare opportunity to visit the Walter P. Chrysler Museum. Cars can be entered online at at http://www.cemaclub.org. Online/advance registration is $15 through May 30th. After that, the fee is $20, including day-of-show. The first 200 paid registrations will get a goody bag and a dash plaque. See the CEMA website or download the show flyer. The North Oakland Macomb Muscle Car Club’s 18th Annual Car Show and all Mopar Swap Meet will be held on Sunday, April 26, at the Packard Proving Grounds, 49965 Van Dyke Avenue, in Shelby Township, Michigan. The historic site is on the west side of Van Dyke, between 22 and 23 Mile Roads. There is free parking and food for purchase at the event. Car show entries are $10 per vehicle including owner and spouse, with swap meet spaces at $20. No prepayment or pre-registration is needed. Spectators over 16 pay $7 at the gate. More information will be provided closer to the event. Houghton Michigan, not a place many of us might be familiar with, but the Ram cold weather group is rather freezingly acquainted with the town. Houghton is where Ram conducts some of its severe duty cold weather testing, and they just released a video showing what some of the cold weather testing entails. Houghton sees an average of 260 inches of snow each year, and combined with the bitter cold of this winter, has allowed Ram to put its trucks through even more rigorous than normal testing. The company does have simulated cold weather facilities, including both “chill rooms” and a snowblower/wind tunnel to see if driving through thick snow will clog the air intakes or completely block visibility.